3 creative salted egg recipes to tempt and tease your diners’ palates. One of Chinese cooking’s most famous traditional ingredients is making a spectacular comeback. Over the years, salted egg yolk has been used in iconic dishes such as salted egg crab, salted egg pork ribs and salted egg buns. In recent years, salted egg’s repertoire has expanded to take its place in even more eateries, restaurants and bakeries. Even McDonald’s jumped on the trend with their salted egg burger in 2016. Other modern twists using salted egg as a star ingredient include chocolate waffles with salted egg sauce, salted egg cake, liu sha (i.e. salted egg) prata, fries with salted egg yolk, salted egg tofu and even salted egg cake. Chefs all over Singapore are already showcasing the incredible versatility of this amazing ingredient. Now, it’s your turn. We’ll even share 3 of our favourite salted egg recipes to help you get started. Putting a European twist on the classic salted egg bun that Singaporeans love, this recipe blends the smooth, creamy texture of flowing salted egg lava paste with the crispy feel of a freshly baked croissant – it’s a perfect collision of flavours that will have your diners coming back for more. Whet your diners’ appetites with this crispy appetiser made from fried potato slices and fish skin – made a whole lot better with salted egg sprinkles that you can serve in a pepper shaker, so your diners can choose the perfect amount of salted egg flavour they want to start their day with. Who can resist this seafood special that features a generous helping of lobster, infused with the rich, creamy texture and taste salted egg? Answer: No one. Include this in your seafood menu to delight your diners! 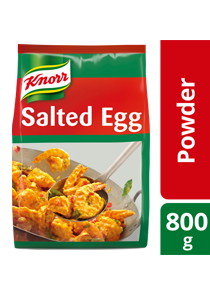 Already have a signature salted egg dish? Have it featured on our map, then get ready as fans from all over Singapore visit your restaurant for a taste of your delicious salted egg dish. Simply complete this registration form now! Why u don't like #maituliao?